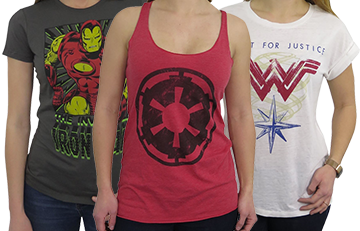 Consider yourself a fan of sports-fashion and/or Wonder Woman? Hmmm. 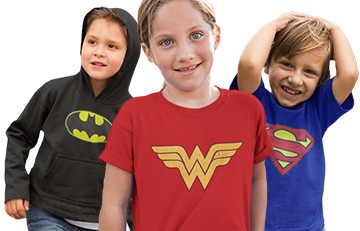 We may have the perfect fusion of Wonder Woman and organized athletics with this particular Wonder Woman t-shirt. 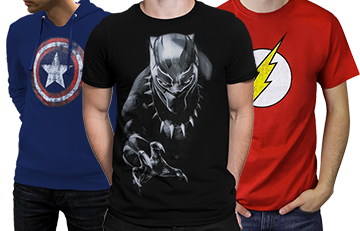 Our blazing red Wonder Woman Varsity V-Neck T-Shirt, made from 50% polyester and 50% cotton, sports a bold yellow Wonder Woman symbol encircled by a blue, star-filled ring. (And let's not forget the subtle, cursive-style Wonder Woman logo hanging just below the uppermost star). What grants this stylish Wonder Woman t-shirt the previously presented athletic aesthetic? That would be the collar's pronounced white trim, and a pair of thick white stripes encircling each sleeve. I ordered the slim XL, I'm 5ft.6in and 150 lbs, and it fits me wonderfully. Love the retro graphics. Love the bright colors and V-neck. Unfortunately this medium fit more like a small, especially in the armpits. I ended up just giving it as a gift to a friend, but would definitely order a size up next time with this product. I bought another Wonder Woman shirt in yellow in medium, and that fit just fine.